Polestar Cyan Racing drivers Fredrik Ekblom and Thed Björk made the most of wet and difficult conditions in Hungary to break into the top five twice during this weekend’s FIA World Touring Car Championship races. ”I am proud to claim my so far best result with a top five finish on a for us completely new circuit and in wet conditions of which we have virtually no experience on with the new car,” said Ekblom, who finished fourth in the first race. Despite being forced to change engine following issues from the past race weekend in Slovakia, missing vital testing time, Björk and the team around him fought hard to equal his and team mate Ekblom’s best result so far by finishing fourth in the second race. The four-time STCC champion then immediately left the circuit after the final race for the airport as he is about to become a father. ”I had an awesome race! I missed testing on Friday, had to start last in the first race and then had to fight an extremely slippery track. To crown the weekend by being so close to a podium finish feels very rewarding. But now I am going to go home and become a father!” said Björk. 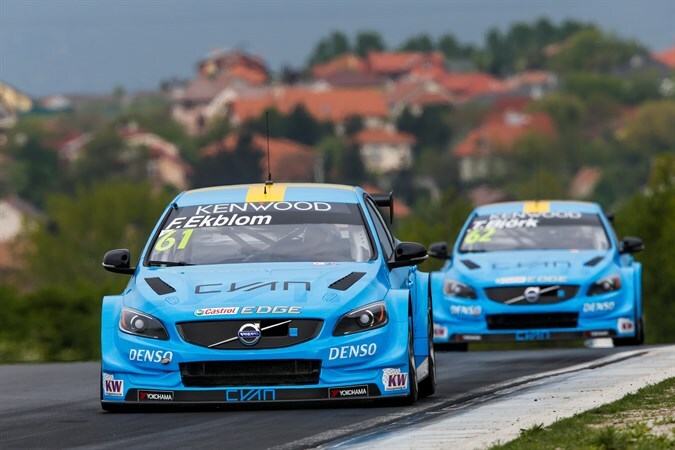 The FIA WTCC races in Hungary concludes the third race weekend in just four weeks for Polestar Cyan Racing, with two new milestones reached in the form of Björk making it to the Q3 session of qualifying and both drivers breaking into the top five in the races. ”The wet conditions this weekend were probably the worst possible for us. That the team managed to deliver under these circumstances is incredibly inspiring. Next up is the tight street circuit in Marrakech, completely different to the first three races we’ve had and it is going to be very exciting taking on that challenge,” said Alexander Murdzevski Schedvin, Head of Motorsport at Polestar. Next up is the WTCC Race of Morocco at the rebuilt Marrakech circuit in on May 7-8th.